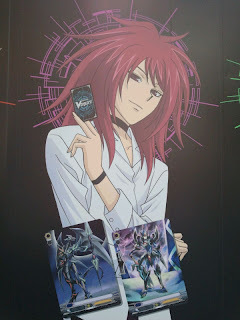 A wall advertisement for the third season of Cardfight!! Vanguard, Link Joker, has just broken the news of Souryuu Leon's return to the anime. While this was already mentioned in Bushiroad's December 5th press conference, exactly in what capacity had not been revealed at the time. Leon's new coat and cravat--speculated to be a school uniform to go with Link Joker's theme--appear to be patterned off of a 1748 dress uniform for a Royal Navy lieutenant, albeit simplified. This is similar to previous imagery used by the series to tie the Souryuu family to the sea, as well as to the past. In addition to this, Suzugamori Ren has been confirmed to be using a Shadow Paladin deck for the duration of Link Joker. 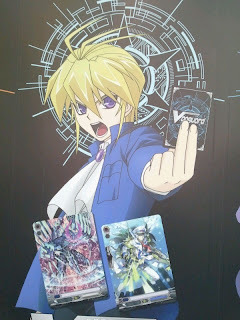 Each character depicted on the poster is shown with their clan for the current season, with Aichi being featured alongside Liberator-based Gold Paladin, Kai with Dragonic Descendant, Misaki with her new Oracle Think Tank units and Ren with Phantom Blaster Dragon and Blaster Dark. This suggests that Trial Deck 10, already known to be a Shadow Paladin trial deck, will feature Ren as its cover character.